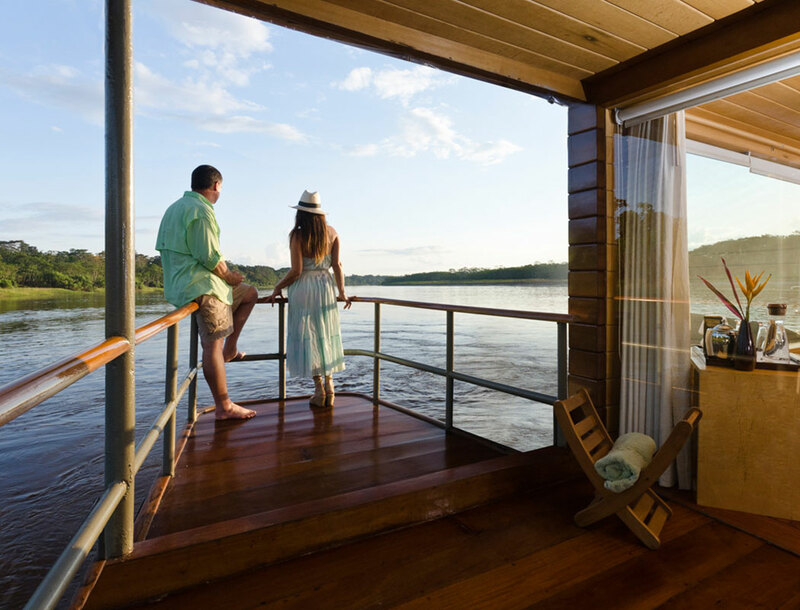 Delfin Amazon Cruises have been a longstanding cruise operator pioneering in luxury cruises across the Peruvian Amazon River. Founded by Aldo Macchiavello, a former senior banker with 25 years experience in the financial sector; Delfin Amazon Cruises is the result of a long held dream shared by he and his wife Lissy Urteaga: to run a boutique travel business in their beautiful country, Peru. Delfin Amazon Cruises has a fleet of three vessels: Delfin I, Delfin II and Delfin III. Proudly the first fleet of vessels to be accredited as Relais & Châteaux accommodation, you can be sure you will get nothing less than the utmost luxury and comfort during your trip. The most private and intimate of the three; Delfin I features four generously sized suites, all with private panoramic terraces. Two of the four also feature a private pool for added luxury and comfort. Your stay on board with floor to ceiling panoramic windows brings the Amazon to your suite without having to move. Cabin service three times daily ensures your every need is met, and your experience is as personalised and as memorable as possible. The vessel comprises of three decks: the main deck, upper deck and the observation deck. The main deck houses the two suites with private pools as well as the crew service area. The upper deck features the other two suites as well as the dining room. The observation deck offers an open-air lounge, bar and higher viewing platform. The dining room on the second deck offers an unrivalled menu of delicious dishes; curated with the freshest local ingredients. The menu is simple and refined, offering the best of the Peruvian cuisine, highlighting the nation’s cultural diversity. Offering accommodation for up to 30 passengers, the Delfin II comprises of fourteen spacious suits; four master suites and ten suites. Two on the main deck and two on the upper deck. The four master suites offer 180-degree panoramic windows, king size beds, individual reading lights and luxury organic amenities. The other ten suites are spread between the two decks. Each has king size beds, large windows, and the capacity to be interconnected to accommodate families. The top observation deck offers a casual lounge area and bar creating a relaxed atmosphere and the perfect place to sit back and enjoy your surroundings. This deck also features a spa room, small gym and lecture room. The spa menu includes treatments crafted around rainforest remedial philosophies. Whether its in the spa room or in the comfort of your suite, you can expect rejuvenation from every treatment. The newest and largest of the three, the Delfin III comprises of 21 suites. On the main deck the eight suites offer floor to ceiling windows. Two of the corner suites at the front of the ship boast 90-degree views of the amazon. The upper deck features ten suites with floor to ceiling windows as well as the spacious owner’s suite complete with 180-degree views as well as a range of luxury amenities. The luxurious bathroom has two vanities, a large mirror and a bathtub. The on board tranquil Rainforest Spa, offers indulgent remedies carrying on ancient Amazonian traditions. From Yucamani stone massages and soothing avocado wraps to invigorating coffee-cacao scrubs that promote wellness and rejuvenation for the mind and body, the spa offers something for everyone. If your ideal form of relaxation is some exercise, the gym with panoramic windows, ensures you’ll never miss a second of your breathtaking surroundings. Like the other two vessels, the top deck features an open air and indoor lounge as well as a bar. In addition, there is a beautiful sundeck with a plunge pool creating the perfect atmosphere for relaxation during the day or night. There is an extensive range of activities on offer across all three vessels. With everything from walks through the jungle, fishing and canopy walks, you’ll never be short of excitement. One of the most exciting activities is swimming with the pink river dolphins; a very rare species, they are friendly, extremely intelligent and love the company of humans. Another highlight is the visit to The Rescue & Rehabilitation Centre of River Mammals (ACOBIA). During your visit to ACOBIA you will have the chance to meet baby manatees, monkeys, river otters, and more. If you’re cruising on the Delfin I or Delfin II, you’ll have the opportunity to go kayaking down the calm waters of the Pacaya Samiria. One activity exclusive to guests on the Delfin I is paddle boarding; the still waters of the Pacaya Samiria National Reserve make it something perfect for all ages. Delfin as well as offering luxurious cruise accommodation, also support local communities and works hard to ensure they are a sustainable company. In particular, Delfin collaborates with the women and children of the small community of Puerto Miguel, through support for their beautiful handmade crafts. In addition, visits to towns like Puerto Miguel create cultural interaction, exchange and education for not only the townspeople but also Delfin’s guests. During these visits guests have the opportunity to view and purchase a variety of beautiful handmade crafts and trinkets. Purchasing the souvenirs helps to increase the income of local families, which in turn supports the children.